The hotel is immersed between 45 hectares of primary and secondary forest, making it a true oasis, enriched by the exuberant vegetation and the diversity of flora and fauna. 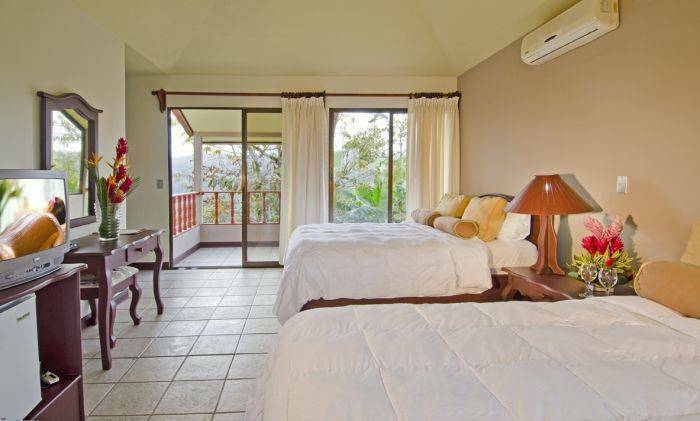 The spacious and comfortable rooms are surrounded by a diverse natural ambiance, which allows you to enjoy the most privileged and spectacular view of the Arenal Volcano. 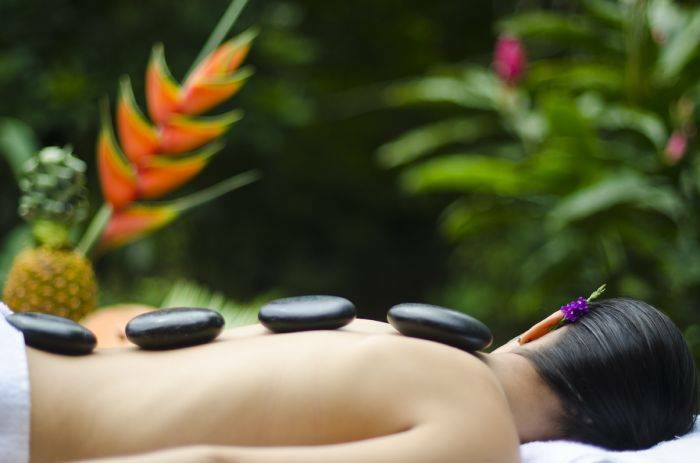 In addition, we offer all the facilities to rest, relax and meditate. In the En-Gadi Spa you can experience body, face and therapeutic treatments. You will under go the ideal techniques to relax, tone and detoxify your body, mind and spirit. 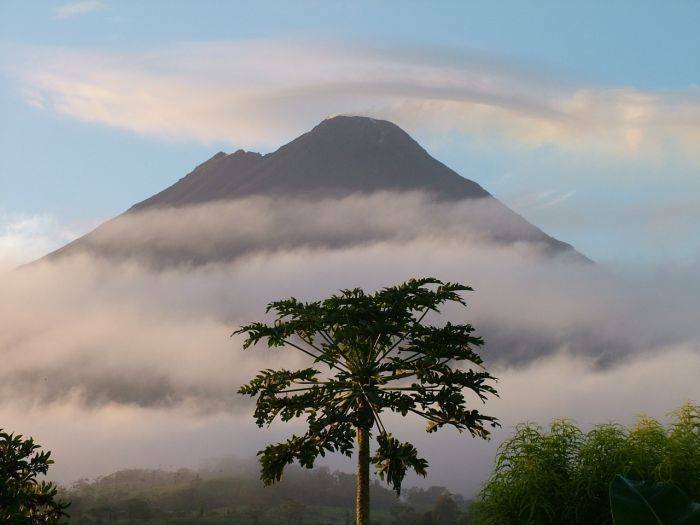 The Acuarelas Restaurant is located strategically to offer you the chance to observe, in its entire splendor and without obstacles, the wonders of the Arenal Volcano. Hiking and Horseback Riding Tours to the Arenal Volcano, the lagoon at Cerro Chato, the lookout place to the Volcano or the Canyon of Arenal River, through natural trails inside the Rain Forest will make these trips unique experiences. Our canopy and rappel offer you unforgettable adventures. We also offer you exclusive private transfers all around the country. Between our facilities we offer: swimming pool with volcano view for adults and one for children, outdoor jacuzzi with volcano view, Spa, indoor jacuzzi with volcano view, natural trails around the property, room service, laundry service, tour desk, souvenir shop and private parking with 24-hour security. Swimming pool with volcano view for adults and one for children, outdoor jacuzzi with volcano view, Spa, indoor jacuzzi with volcano view, Massage rooms, Natural Trails around the property. Excellent trails all around the property for handicap. Restaurant serving Costa Rican and International Food, with privileged view of the Volcano. Wet Bar with view of the volcano, Room Service, Laundry Service, Tour Desk, Souvenir Shop and Private Parking with 24-hour Security. All the rooms have direct view to the volcano, even from your bed. All the rooms have terraces covered by windows and furnished with a table and rocking chairs. 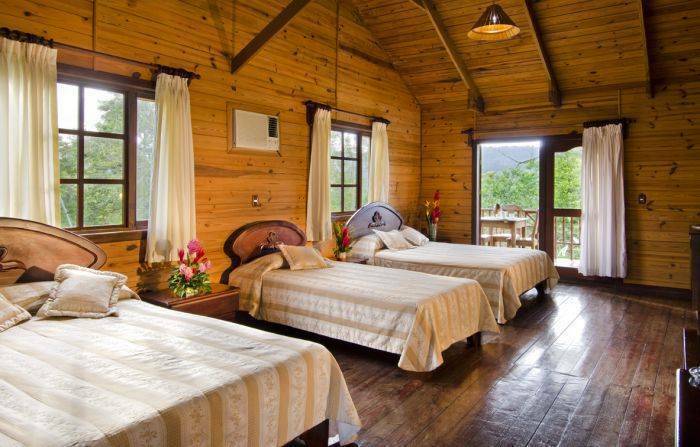 Most of the Deluxe rooms have an incredible view of the Arenal River Canyon. All the Standard and Deluxe rooms are equipped with: Air Conditioning, private baths with hot water, fully equipped mini bar, coffee maker, cable TV, safety deposit box, telephones and high quality amenities. In addition to the basic furnishings of the Deluxe Rooms, the Junior Suite has a Jacuzzi with an excellent view of the volcano. This Jacuzzi is located right at the entrance of the room where the terrace used to be and it has specials windows in front of it. Besides it has a private bathroom with shower, ironing board and iron and it has two double beds. The Junior Suite has furniture completely new. In addition to the basic furnishings of the Deluxe Rooms, they have an independent living room with fully equipped mini bar and a sofa bed, jacuzzi on the bathroom, kitchen/bar, microwave over, basic kitchen equipment, ironing board and iron, and a furnished terrace to enjoy the beautiful Volcano view. 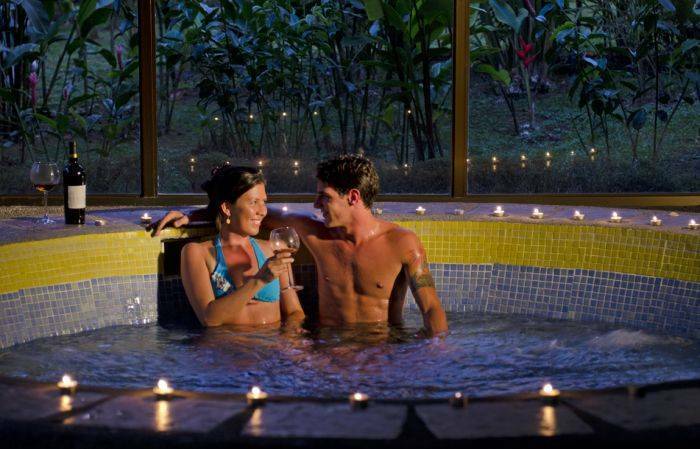 The Hotel is located in La Fortuna area, a very famous and visited place because of the spectacular view to the Arenal Volcano and becuase of it`s healing hotsprings. Our Executive Chef offers you a wide variety of dishes ranking from “Costa Rican Cuisine” the most popular dishes of our country, to the best of the International Cuisine. Montaña de Fuego Hotel & Spa is located in the Arenal area, 10 minutes North West from La Fortuna, San Carlos, Northern Region of Costa Rica. Take the road that goes to Puntarenas and make a right in San Ramón, go through the town from east to west until the hospital, there will be a sign of Villa Blanca and Bajo Rodriguez. Keep going on that road passing by La Tigra, Chachagua to La Fortuna, then, turn to the left from east to west on the direction to the Arenal Volcano, keep driving for 5 miles and then you will find us at the right side of the road. To reach our hotel coming from Liberia you must be take the way to Cañas on the Panamerican High Way for approximately 1. 30 hours. 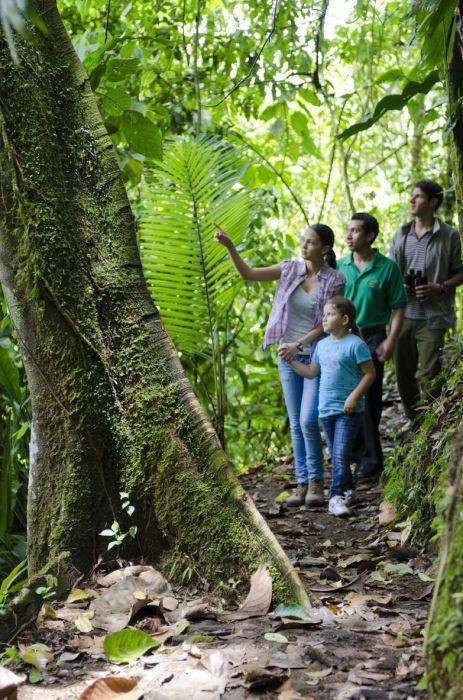 Make a left turn on the way to Tilarán and go around the Arenal Lake passing by Nuevo Arenal. After to get to the Dam keep on the road for 5 miles to find our hotel. Nearest airport: International Airport Juan Santa María, 3 hours distance.